Every now and then a pokie comes along with such a crazy theme that it is simply impossible not to play it with a smile on your face. Kitchen Drama : BBQ Frenzy is one of those games. The fledgling developer No Limit City developed it. Their talent has already secured them distribution deals with many operators. They recently expanded their team into larger offices in Stockholm and Malta and judging by the quality of BBQ Frenzy, their success will keep growing in the market. It is so important to be able to stand out in the crowded pokie space and it is naturally easier said than done. BBQ Frenzy quickly establishes its own identity from the word go. When you first see this pokies’ reels you will know you are onto something special. The entire game takes place over red hot BBQ coals. The reel symbols are the various meats and vegetables that you are cooking on the grill along with a few stray hunks of charcoal that somehow found their way onto the grill. Malcolm Mizzi who is the head of sales with No Limit City said that this game really expands the features and themes that they have been developing throughout the Kitchen Drama series. While the previous Kitchen Drama title, Sushi Mania was a great game with engaging elements, BBQ Frenzy really steps things up. 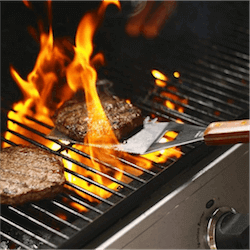 As the Product Owner Per Lindheimer said in a press release, BBQ Frenzy adds more fire and more flair. Speaking of fire and flair, BBQ Frenzy features 3 wild symbols, one of which is a spicy red chilli pepper. There is also the Sheriffs Badge wild symbol and the sheriff himself. This sheriff just happens to be a juicy steak and he only appears during the game’s special bonus features. There are three main bonus games in BBQ Frenzy. The first is the Fiery Chilli Spirit Spin, which triggers after any 3 consecutive wins. When it activates a random symbol on the reels will become wild. The second bonus feature is the Wild BBQ Bounty. This is activated randomly and turns a steak, green pepper or mushroom icon to turn wild randomly. Finally there is the Wild BBQ Spins feature. This is a tricky one to activate and requires you to land a win that features the Green Pepper, the Steak and the Mushroom. This will trigger 5 free spins with each steak sheriff wild appearing on the reels landing a 1x multiplier to your wins. BBQ Frenzy is set to go live at all compatible casinos in December.